Land-based casinos are big on theme games. I Dream of Jeanie and the Munsters from popular TV shows, Wheel of Fortune from the game show and Catch a Wave that features the hit song by the Beach Boys to name a few. 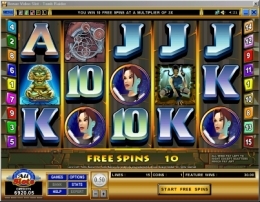 Now the theme craze has reached the online casinos in a bonus video slot based on the hit movie Tomb Raider. This 5 reel, 5 coin, 15 pay-line bonus video slot features the lovely Lara Croft as the bonus scatter symbol branding two lethal weapons, one in each hand. A scatter win multiplies your total wager by the number of Lara Croft scatter symbols displayed. 2 Lara Croft scatter symbol stopping anywhere on any 2 reels doubles your wager; three triples your wager and so on. 3 or more scatter symbols triggers the 10 free spin bonus feature where each pay-line win is tripled. Get the scatter symbols again during a free spin bonus round and the free spins are retriggered. Another bonus round can be triggered when 3, 4 or 5 gold idols stop on a covered pay-line. In this bonus round you enter a tomb where 12 more gold idols are spread across the tomb's interior. You get to pick 1 gold idol from the tomb for each gold bonus idol that stopped on a covered pay-line. When you select an idol your win amount is revealed. The win amount can range from 36 coins to 2500 coins depending on the number of idols that stopped on a covered pay-line. The gold idol bonus round can be triggered during the free spin bonus round. Five Tomb Raider game logo symbols stopping on a covered pay-line wins the top prize and also doubles as a wild symbol when paired with any two other symbols except for the Lara Croft scatter and gold idol symbols. Three other high paying symbols include a crouching Lara, tiger and a mechanical gadget. The lowest paying symbols include 4 letter symbols and 1 number symbol. Except for scatter wins, free spin and gold idol bonus rounds pay out is from left to right only.